My son is so excited to be making Valentine's Day Kabobs again this year for his class! Each year, the teacher asks for healthy food snacks for their class party. I love being able to make something that is fun and healthy and so these are the perfect combination! How fun are these Frankenstein Treats that we made with our best friends last week?! The kids LOVED making them and us moms loved them making them as they were easy, relatively mess free AND they were super cute and the kids were so proud!! Chewiest Oatmeal Chocolate Chip Cookies EVER! One thing we love is trying new cookie recipes. 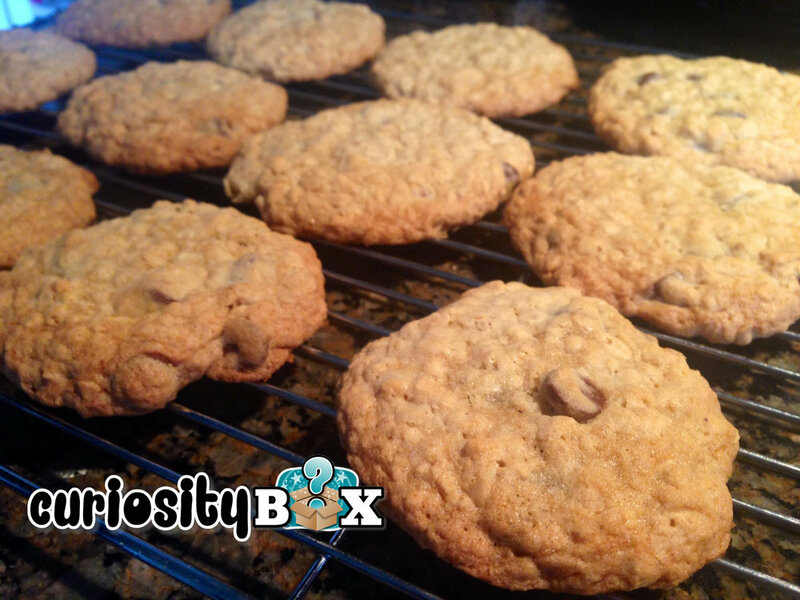 We have tried many different ones over the years, but this is still my favourite go to for a delicious, chewy oatmeal chocolate chip cookie! They are always a huge hit wherever we take them and I'm always being asked for the recipe... so here it is for me to share with you! This recipe is great for the kids to help out with and I love taking the cookies camping, to parties and picnics and I've made them for birthday parties and playdates with my kids and also for a great afternoon snack. Ok...I'm not going to lie either, but I've made them for a late night snack too when I've been craving them. Believe me when you make these you will totally understand! We enjoy them the best with the milk chocolate chips, but you could make them with the dark ones or the white ones and they would be great! I've also debated on trying them with raisins or craisins but I'm afraid to play around with the recipe too much. lol. First thing you will need to do is cream together the butter and the sugars. We use our Kitchenmaid mixer as the kids really like to use it, but you can just use a hand beater as well. 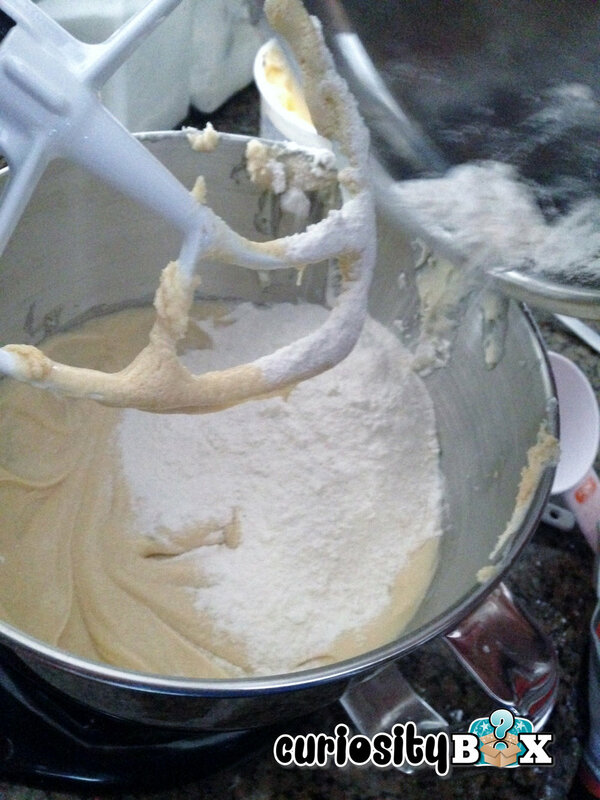 Then add your eggs and vanilla and mix them in until creamy and mixed in completely. In a separate bowl, sift the flour, salt and baking soda. Add to the creamed mixture and mix completely. Then add your chocolate chips and any other ingredients you want to add (i.e. craisins, raisins, etc.) and your almonds. The trick to these cookies is when you go to place them on the cookies sheet. They are gooey and messy and can be a bit tricky to place. I typically like using a spoon and "plopping" them on the tray. I have tried rolling them and they don't work out as nicely. Cook in the oven for 8-10 minutes. Make sure you take them out when they are light brown and not dark brown as they will become too hard if they are overcooked. Let cool and enjoy! If you're looking for other recipes, check out our Baking section HERE. This has been a family favourite of ours for a few years now. This yummy snack is perfect for after school, a special treat in kids lunches, a yummy dessert or is also good for Easter dinner get togethers and especially great for kids Easter parties in their class room as a special treat. Some call it by other names such as "Bunny Chow" or "Muddy Buddies" or "Puppy Chow" but we liked the name Bunny Food for Easter and my kids say that it tastes like Vanilla Cupcake so it works! I have to say, this delicious snack was hard to share. Yes, I will admit I might have indulged in it and had to make a second batch the first time I made it! Now I know enough to double the recipe. I have seen other recipes like this where they add peanut butter, mini eggs, pretzels and other items so I guess you could really add anything to this delicious recipe. 1. Measure out cereal in a large bowl. Set aside. 2. 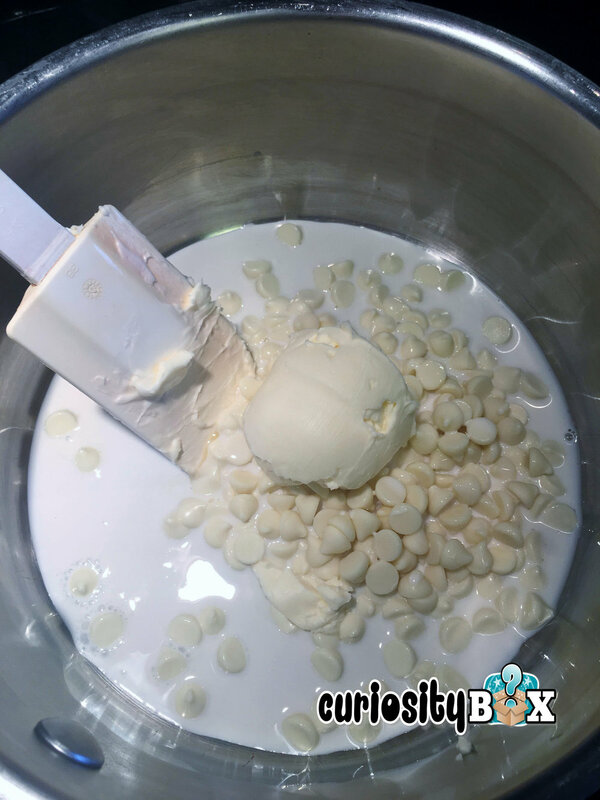 Measure white chocolate chips, butter and cream and vanilla extract in a pot stirring frequently as to not burn the ingredients. Set aside and let cool. 3. Pour the ingredients over the cereal. Mix it thoroughly. 5. Add icing sugar and sprinkles and any other toppings that you like. I try really hard to set it on my counter and all of us to snack on it, but it literally lasts 5 minutes! I think that it would be super cute in little Easter baskets with some plastic wrap or little baggies with a ribbon and a bunny tag with "Bunny Food" on the label! Don't you?! This time of year is so busy and let's be honest, we don't have a ton of time to do hours and hours of baking. This year, my mom and I did our annual baking and I thought I would try a new recipe that turned out AMAZING! 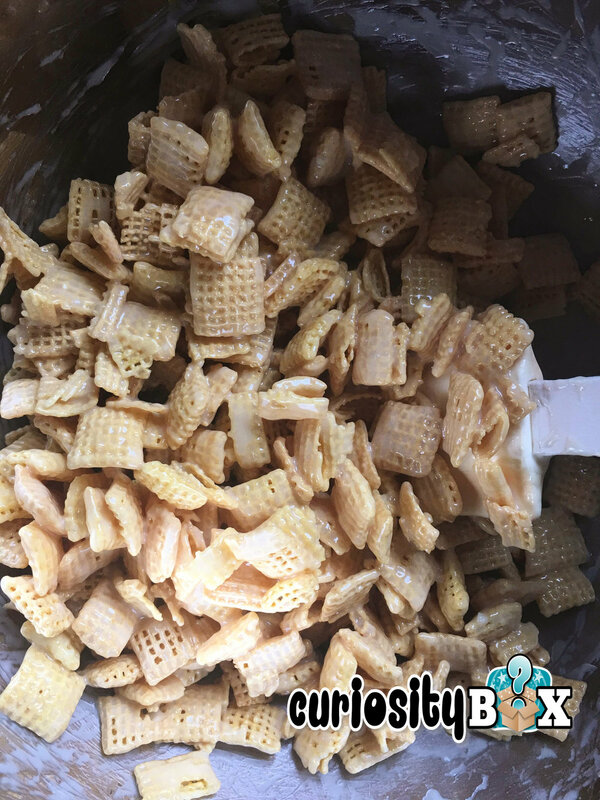 Crush the Ritz into fine crumbs and put in mixing bowl. Add 3/4 of the Skor bits and the can of Eagle Bran milk. Spray cookie sheet with Pam. Spread mixture onto the cookie sheet. Cook at 350 degrees for 8 minutes (no more). 7. Make sure you cool off completely before cutting into squares or they will fall apart. They are SO yummy! Do you have a favourite recipe? Head on over to our Facebook page and let us know what it is. Also, there's still time to give the gift of curiosity and creativity with a Curiosity Box Subscription! Did you know that we are the leading Canadian Subscription Box Company that offers FREE shipping anywhere in Canada? We will also be adding a book subscription for children option! Stay tuned for more information. Last year we made these adorable Christmas treats for my son's classroom! They were easy to make, the boys enjoyed helping and let's face it...they are simply adorable! 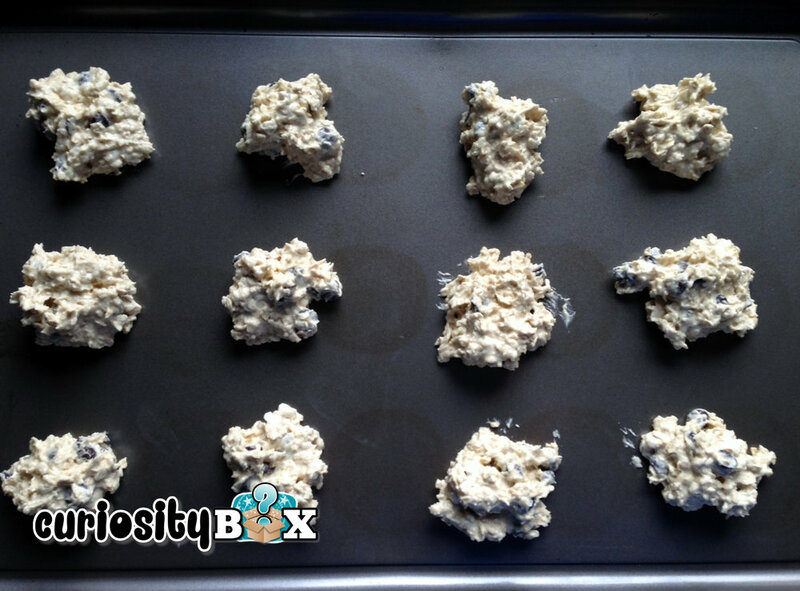 Place parchment paper on a cookie sheet. Lay out the square pretzels and place two roles on top of them. Place them in the oven on broil and watch them as they get soft and melted just a LITTLE! Make sure you watch them and don't overcook them. Take them out of the oven. Before they cool completely, place the normal pretzel on top of the rolos and push them down so as the chocolate hardens, it will hold the pretzel in place. Then push the Smartie down as well so it makes the reindeer's nose. These are perfect for a class party, a Christmas potluck, staff party's or the bus driver! Put them in a tin or a fun Christmas bag and they are super cute. I can't wait to share with you what we have up our sleeves this year! 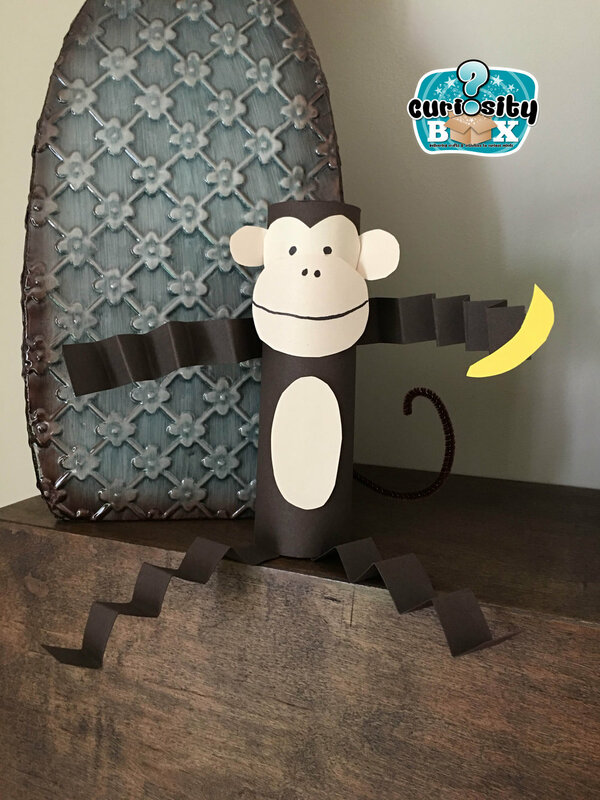 Here are some fun ideas on how to incorporate a full theme into your weekend fun and what better theme than monkeys?! I thought it would be fun to have a full theme so that you can incorporate some crafting, games, a recipe and a printable! Such a fun little craft to do on a rainy day! 1. Wrap the toilet paper roll in brown paper and glue. Cut out legs and arms in strips of brown paper. Accordion fold them. Glue them to the back of the body. 2. Cut out mouth, eyes, ears and tummy in beige paper. Draw eyes, nostrils and mouth. 3. Cut out banana and glue to one hand. 4. Curl pipe cleaner and glue to the back of the body. This is a family favourite with my little monkeys! Combine dry ingredients in one bowl. Mix well. Mash bananas in another bowl. Combine butter, sugar, eggs with the bananas. Add dry mix. Mix well. Bake at 350 for 55-60mins. Monkey See, Monkey Do...Everything I do, You Do Too Activity! This is a game for 3 or more players. But the more players you have, the more funny and exciting it is to play! 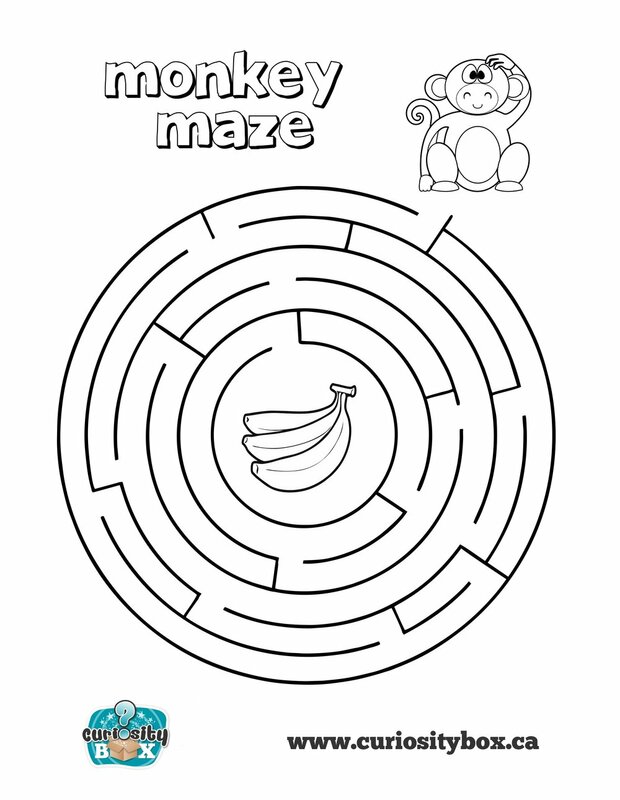 One player is the guesser, one is the monkey and the rest follow the monkey. Decide which player will be the guesser. That player leaves the room. Have the guesser leave the room. The remaining players then decide who will be the monkey. The other players have to do whatever the monkey does. If she scratches her head, the rest of the players have to scratch their heads. The guesser tries to figure out who is the monkey. The monkey should try not to get caught changing the action. If the monkey gets caught, then she becomes the next guesser. Here's another fun little acticity for your little one to enjoy! Click on the photo and download the file or right click on the photo and print! Who doesn't love Banana muffins?! Not only are they a great snack but they are an easy school lunch option as well. I love making this recipe as mini muffins as the kids can't get enough! Here is my recipe for Banana Crumble Muffins! Mix Flour (1 1/2 cup), baking sod and baking powder and salt. In another bowl mix bananas, sugar, egg and butter (melted). Spoon into cups then mix streusel and sprinkle! Now, the key is to grab one, make yourself a coffee and enjoy!! !